Akshay Kumar calls ‘Ghar Layenge Gold’ from Gold the winning anthem of the year! 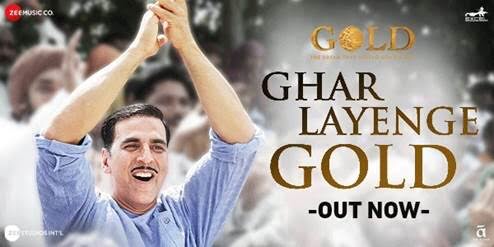 Calling it the winning anthem of the year, Akshay Kumar has released a new song from GOLD, titled, Ghar Layenge Gold. Not only is the song amazing, the video really takes you inside the movie and shows Akshay Kumar’s character selecting members for the hockey team. Not only that we see other scenes that show what challenges the team will face to achieve their goal. Voiced by Daler Mehndi and composed by Sachin-Jigar, the winning anthem of the year will give you goosebumps. Apart from Akshay Kumar, GOLD features Amit Sadh, Kunal Kapoor, Vineet Singh, Sunny Kaushal and Mouni Roy. The story of GOLD highlights India’s emergence from the shadow of the British Empire as it meets the British hockey team on the field, this time as a nation of its own. GOLD is an inspirational story of a team that fought all odds to bring their nation hope, pride and respect. GOLD is set to release on August 15, 2018. 16 queries in 0.469 seconds.